There is latest 2.7.0.15 for beta test where we fixed "Invalid license" error. Please download it then test. Dear user, we took some time to studies on the license problem. Verify that the file has been deleted from both folders. It is important. 3. Follow the steps circled in a red circle. 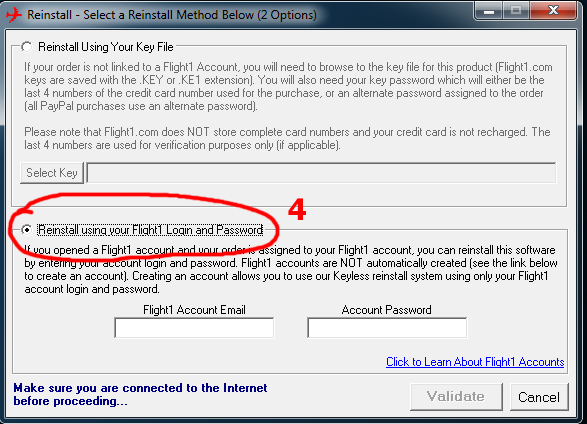 In this step enter your purchase data which you got during purchase EZCA. Next, the installer will tell you that the license will be installed in the C: \ EZdok Software folder. Do not change this way! 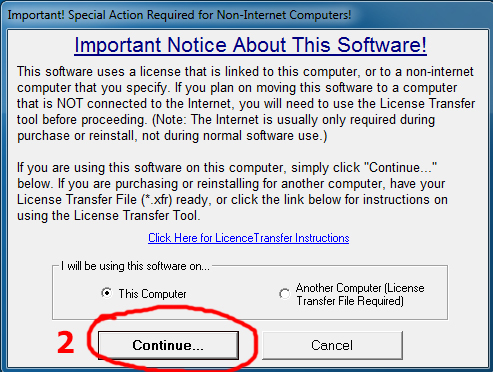 Click Ok.
After this step, the installation of EZCA2.0 will be started. You must continue the installation until it is complete. 5. Install the update 2.7.0.10. We apologize for these inconveniences. Be sure to write in this thread if the problem is resolved or not. This will help to eliminate this unpleasant problem as soon as possible. In the first message of this thread i give link to latest 2.7.0.15. Is the bug "Invalid license" is fixed or not ? I am pleased to report that this appears to have SOLVED my licensing issue. Also, the usual P3D crash on EZCA exit seems to have been solved as well. Alright, so when I press the joystick button to return to virtual cockpit, it apparently turns into a black screen. I can avoid this by not pressing the joystick button, but that is quite annoying obviously. Do not use mouse menu for select cameras. After install EZ , the EZ will take control for switchind cameras. Built in simulator camera switching system will Off. Use "A" "S" keys for switch to Spot camera. Use EZCA hot key to return to VC camera . 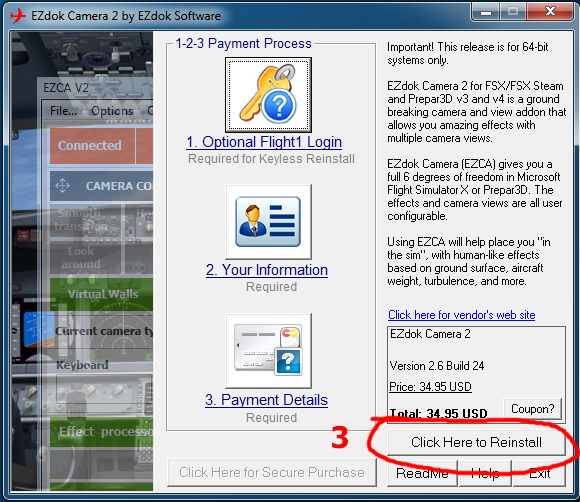 For this , you should assign hot key or joy button to desired EZCA VC camera. The first EZCA VC camera named "Captain". I assign "1" HotKey to this camera. I use A S key for switch to Spot , then I will press "1' to switch back to "Captain" camera. Remember , only with assigned HotKey to EZCA VC camera you can return to VC mode. 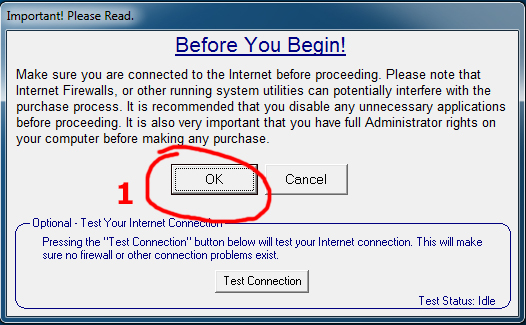 And i also found the reason why i was not able to click anything in FSLabs with EZDOK. It very very old bug since FSX.. Cannot criate file “C:Users\VBL\AppData\Roaming\LockheedMartin\Prepar3Dv4\Controls\Standard.XML”.Acesso Negado. Hi , Vagnerer , please redirect your question to our tech support via ticket system. Here is talk about bugs in a beta version (2.7) of EZ. Configure tool have old 2.6 version. Can not create file "C: Users \ VBL \ AppData \ Roaming \ LockheedMartin \ Prepar3Dv4 \ Controls \ Standard.XML" .Access Denied. Actually I wanted to know how to install and update correctly, since I had installed version 2.0.2.18, I just installed 2.7 and I was left with this problem, I do not know if I did the right thing. Having the same issue here, zoom seems to be locked in Aircraft external view. Virtual cockpit zoom works fine though. Thank you all for the information. We study the problem with zoom in external views. Now we are looking for the problem ZOOM. This can take 2-3 days. It is required to analyze a lot of code. Please be patient. This is 2.7.0.15 EDIT 2 version. Please test it. It is same 2.7.0.15 but resh.exe is modified. It should fix ZOOM error. Please tell me about any problem with this buld. Is this with EZCA 2.7 BUILD 15 ...?? Please download latest 2.7.0.15 in the first message of this thread. Please, any help with my problem??? Vagnerern , please redirect your question to our tech support via ticket system. What build of EZCA you using now ? 2.7.0.15 or 2.7.0.15 edit 2 ? I tried both, but are they only for p3dv4.3 ? For Prepar3D versions older than 4.3 you should use EZCA 2.6.0.32. Versions starting from 2.7 were released for compatibility with P3D4.3. All functionality remains the same as version 2.6.0.32. The problem still here; Zoom blocked in 0,48 I guess. Just downloaded this last edit version & tried. Foe me as well, using the latest build, still blocked at a zoom of 0.48 in external view. We know that the zoom control of the mouse wheel does not work in external views. But you can still change the zoom with the keyboard + / - buttons. The fix will be available in the next build, but it will take some time. I just got the "Invalid License" error with 2.7.0.15 Edit 1 after a few minutes of flying. Now I have updated to 2.7.0.15 Edit 2, but have not tested fully - has there been done anything from Edit 1 to Edit 2 that possible would fix the issue ? Otherwise the bug might still exist ! Is this happen for all aircrafts ? If yes - please reinstall license. I only saw this in the A3A Texan-6, restarted P3D and flew again in the T-6 for 15 mins without further issues. So I will wait and see if it happens again. Do you have reinstalled license now ? I update P3D to v4.3 and Ezdok. I have problem with World cameras. I create a new camera, point the anchor point, turn the head, zoom. I save this camera. But the by camera save only the zoom. I return where I was at the beginning of the creation of a new world camera.